Whether you are intending to breastfeed or bottle feed your newborn, a feeding pillow is one of those non-negotiable new mom essentials. Sure you can try to get away with using a regular pillow, but after repositioning it, propping it up, lifting it higher and generally becoming really irritated for the hundredth time you'll be off to get a proper nursing pillow anyway. The last thing you need is extra irritation when you are learning to breastfeed - believe me - it's difficult enough to get the latching right without taking part in a simultaneous pillow fight! And even if Dad is feeding with the bottle he'll appreciate the support - men don't have hips and bellies you know! We like this feeding pillow because: It has an easily removable, washable slip cover available in lots of different designs. There is also an organic slipcover for eco-friendly nursing. It is small and lightweight making it easy to take with you wherever you go. What we don't like: If you are a tallish person it may not be high enough for the ideal feeding position. 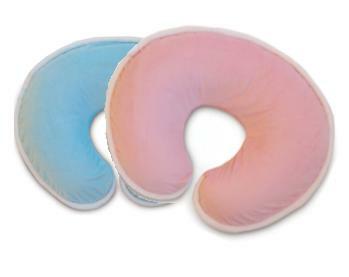 We like this nursing pillow because: it is recommended by lactation consultants and it also comes with a wide variety of removable, washable slip cover designs. You can buy a pillow with an organic slipcover if you are eco-conscious. There is an inflatable travel pillow available which is small, lightweight and easy to store. What we don't like: Nothing - we like it! Fit around you so that the feeding pillow stays put even if your baby is a wriggler. If you are unfortunate enough to require an episiotomy during your baby's birth you will experience an altogether different kind of agony - been there - done that. I'm sorry to be blunt, but it really hurts after wards. I found relief by sitting on my breastfeeding pillow. It stopped the stitches from pulling quite so much. When your baby reaches the "Look I can sit up, whoops I'm falling over again stage" a feeding pillow is a good way to prop him up. The u-shape means that he will be supported behind and to the sides which is what he needs. And if he does fall, it will be onto the softness of the pillow - not a hard floor. Your feeding pillow needs to have an easily removable, washable cover. It's best to have a spare for when the first slip cover is in the wash. Think about whether or not you will want to take your pillow out of the house. Some pillows are easier to lug around than others. Try to find a feeding pillow that coordinates with your nursery decor since your pillow will spend a lot of time on your feeding chair. Do you have a favorite nursing pillow? Let us know and write a review of your feeding pillow. You'll receive a free ebook! I hope this page causes you to ditch the idea of trying to use an ordinary pillow when you feed your baby - it really isn't worth the hassle!